This was a long day-hike, starting in N. Cheyenne Canyon Park and ending near Manitou Springs at the entrance to Crystal Park. The route included Gold Camp Road, Seven Bridges trail, Jones Park, Mt. Garfield, bushwhacking north to Cameron Cone, and difficult route-finding down from Cameron. The first segment of the hike was a repeat of previous hikes up to Mt. Garfield. I had lunch at one of my favorite overlooks on Garfield. view west from Mt. 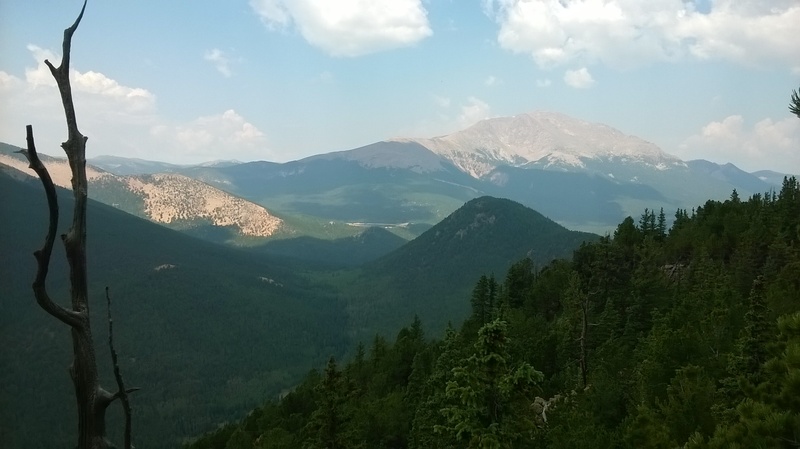 Garfield, overlooking Bear Creek, Tuckaway Mountain, and Pikes Peak. Then it got interesting. No trail exists between Mt. Garfield and Cameron Cone, but I had a route in mind following the ridge from Mt. Arthur north. I made my way using topographic map, compass, and orienteering skills. I think it took about 2-3 hours to go the approx. 2 miles from Garfield to Cameron Cone. Route-finding in this area was slow-going–working around fallen trees, big rocks, brush, etc., while stopping often to check compass and map. I did find some cairns marking a route up the southern slope of Cameron Cone which helped. By the time I reached the summit of Cameron Cone, storm clouds were threatening to the northwest. So, i didn’t linger up there. 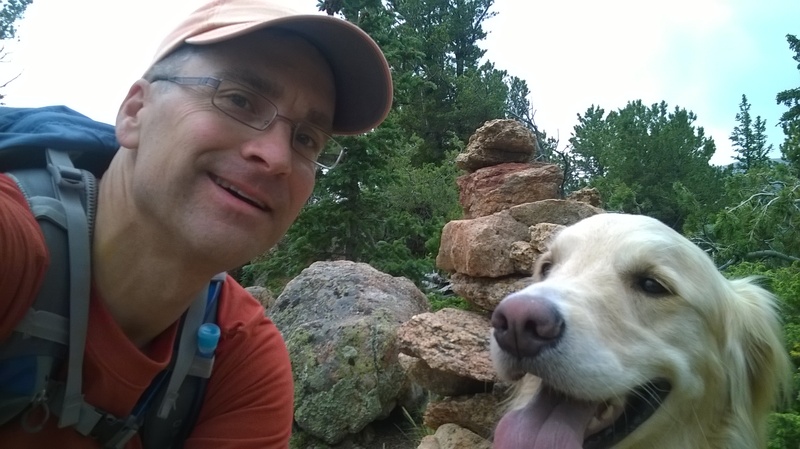 My plan for the route down was to take the trail on the north slope and end up at the Barr Trail trailhead. But, the trail on the north side of Cameron Cone is quite difficult to follow. The trail is not clearly defined, and not well-marked. I lost the trail several times, but found it again by back-tracking. During the descent, there was some lightning several miles to the north, which added stress to the experience. I wanted to get down as quickly as I could, safely. The storm drifted off to the east and never did reach us. About 1/2 way down, I hit the dirt roads in the upper section of the Crystal Park neighborhood. From the road, I could not find the trail to Gog and Magog rocks and Englemann Canyon! I was out of water and it was getting late in the day. So, the most reasonable option I could see was to walk all the way down the road through Crystal Park, even though it’s private property. This added additional time and distance to the hike. At least we made it down. Michelle picked us up at the entrance to Crystal Park–boy, were we happy to see her! She drove us back to the 4-way to pick up the other vehicle. Perhaps I’ll try Cameron Cone again sometime, starting at the Barr Trail trailhead, in order to find that trail and figure out where I went wrong on the way down. 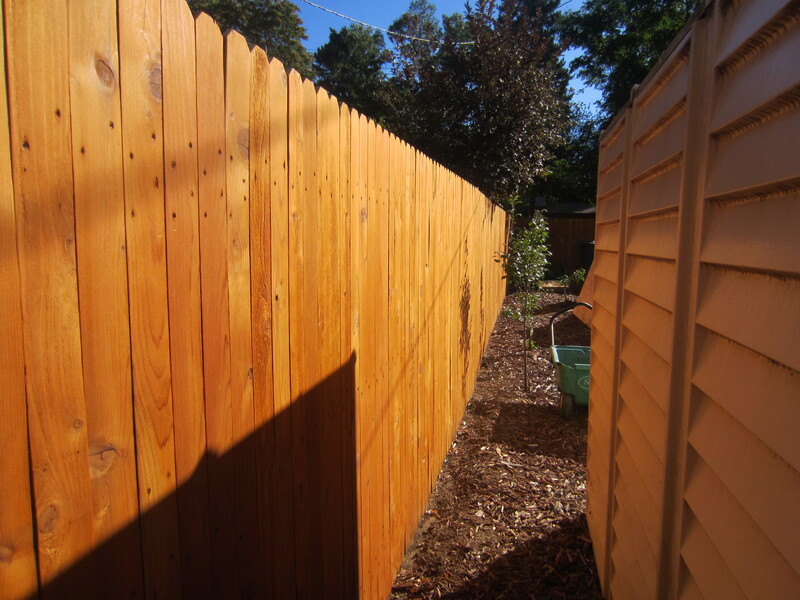 This Summer I tore down and rebuilt 206 linear feet of cedar fencing in our back yard. 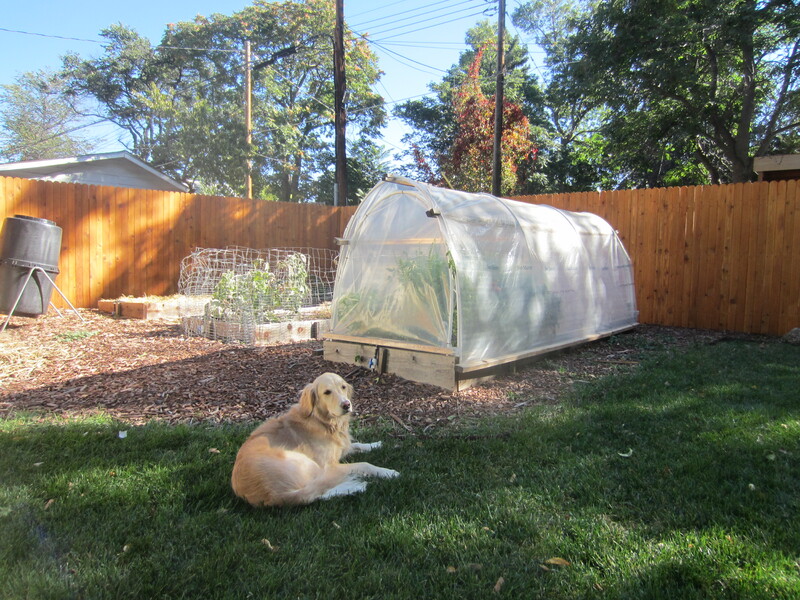 This blog post is to help me remember what I did and when. 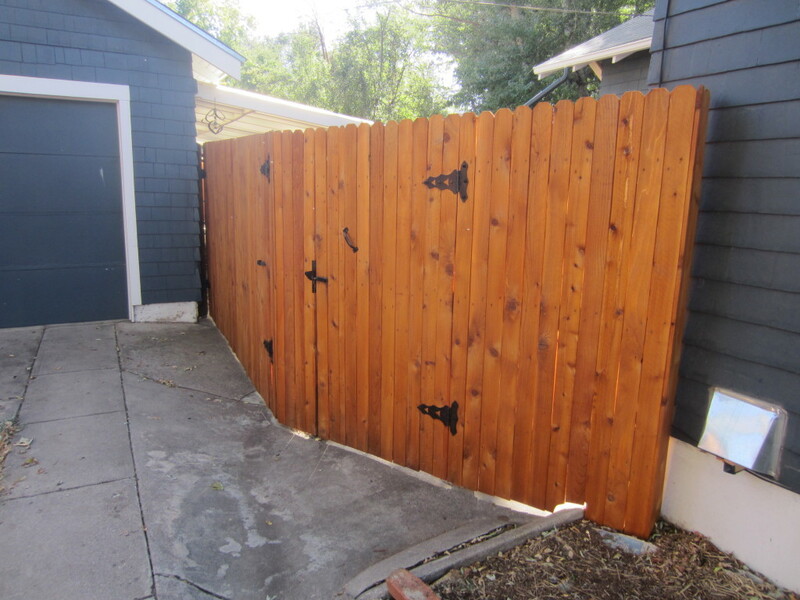 The old fencing was installed by a previous owner, so it was at least 20 years old. Practically every Spring/Summer since I’ve owned the house, I’ve had to replace a handful of posts due to the wood rotting. The old pickets had never been treated, so they had the gray-weathered look. 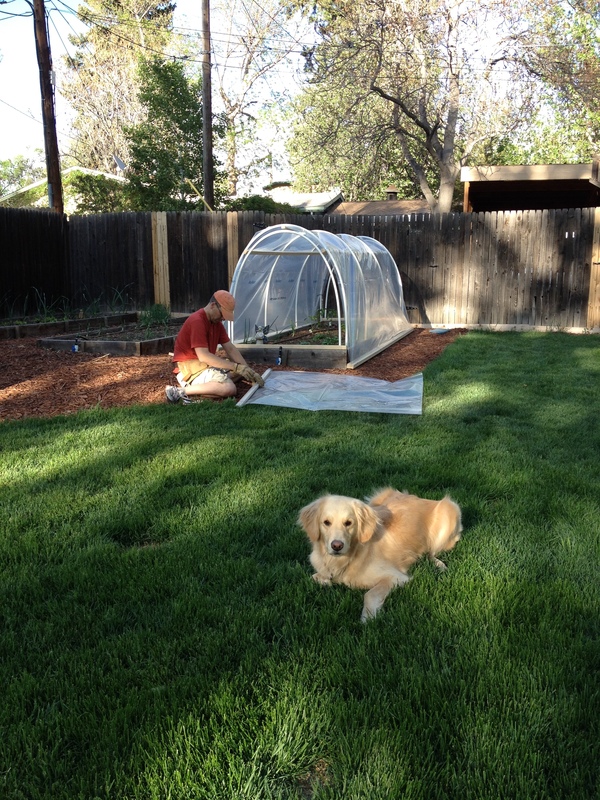 Chris building hoop tunnel for garden in back yard in May 2013. 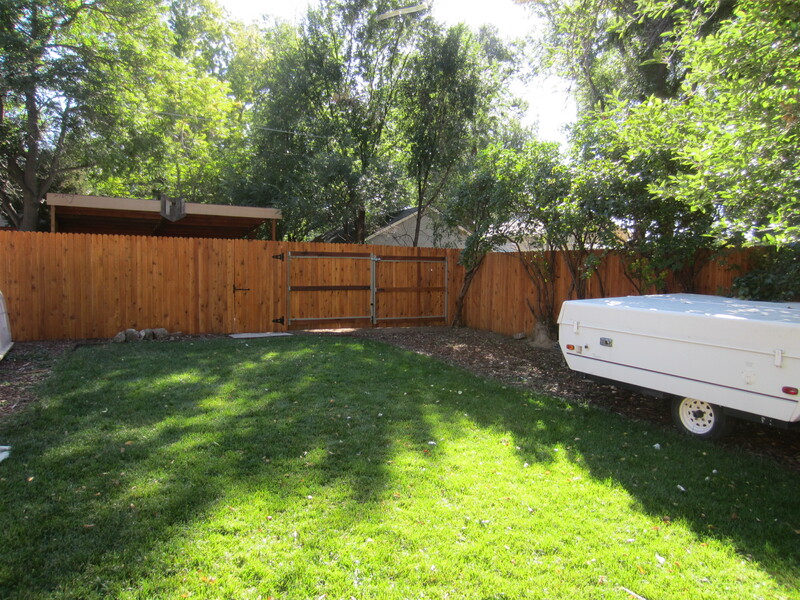 I worked this project all Summer 2014, completing about 25-40′ sections per weekend. 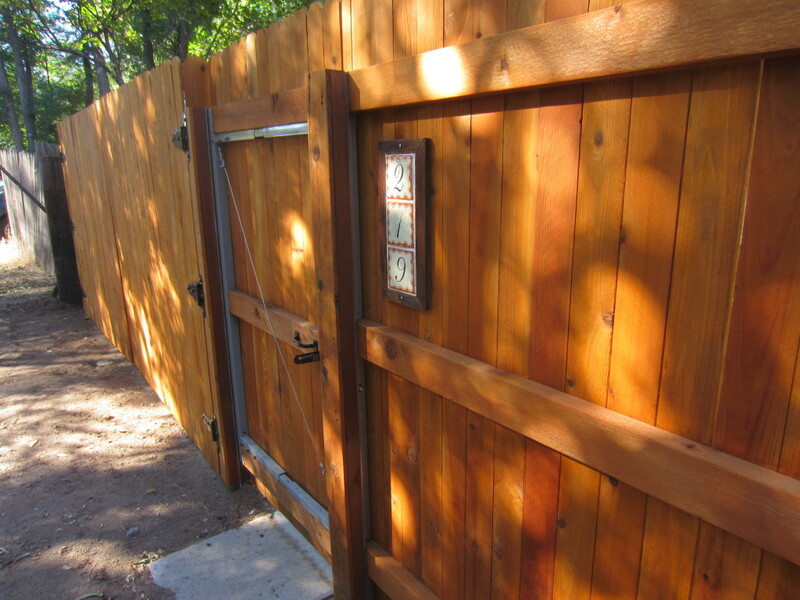 The new fence is built with PostMaster steel posts set in concrete, cedar 2×4 rails, and cedar pickets. 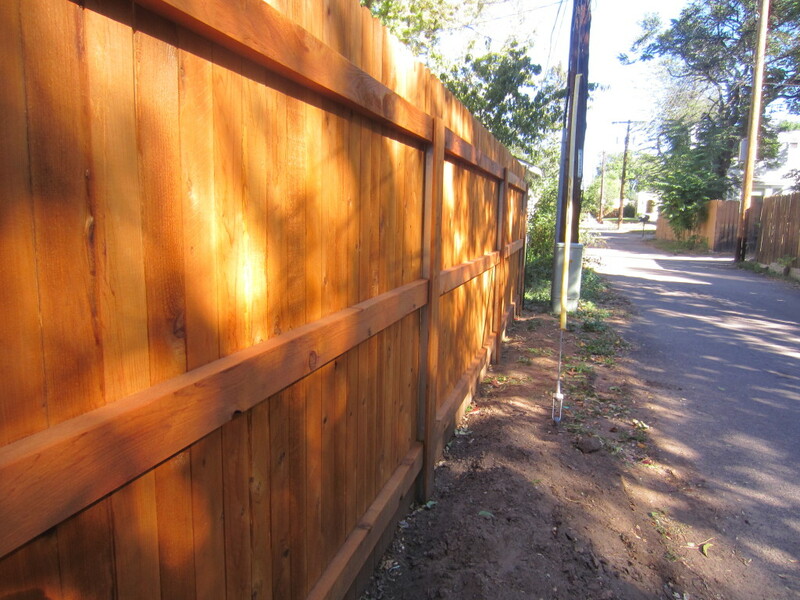 I covered the back side of each steel post with a wide picket for aesthetics. 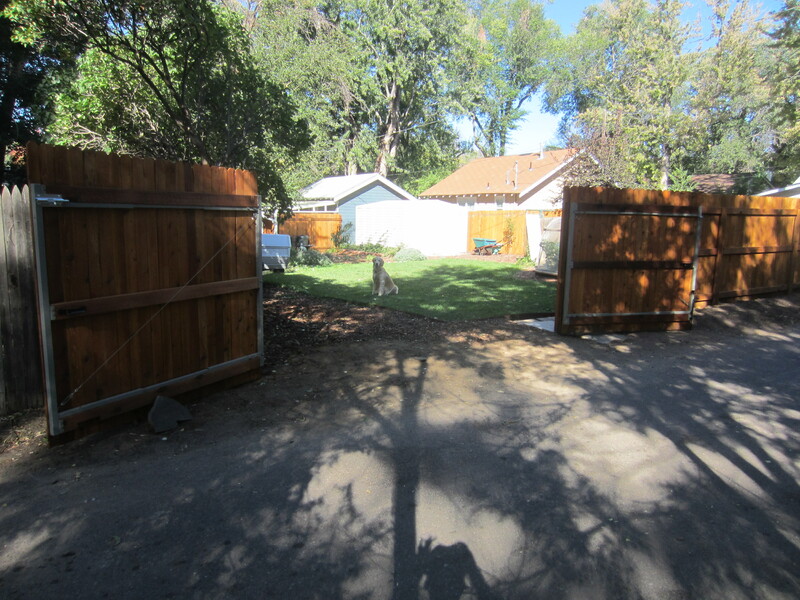 The new gates on the alley side are in a better location for how we use the back yard. Finally, I sanded and stained with Sikkens Cetol SRD in Cedar tint. 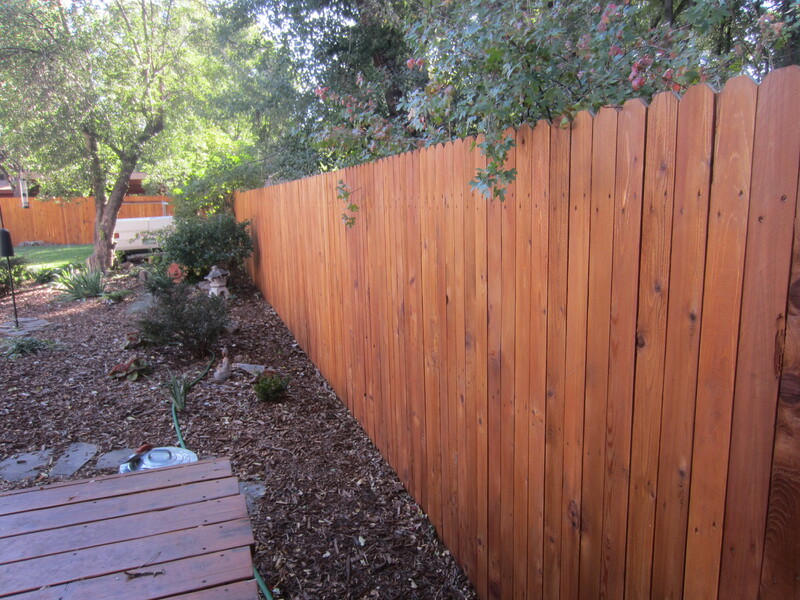 Michelle was great help with project–being supportive in general, selling the old materials, and with the staining! I really hope that the steel fence posts live up to expectations that they will last for decades without need for replacement, making the annual chore of replacing fence posts a thing of the past.